Flutacious! 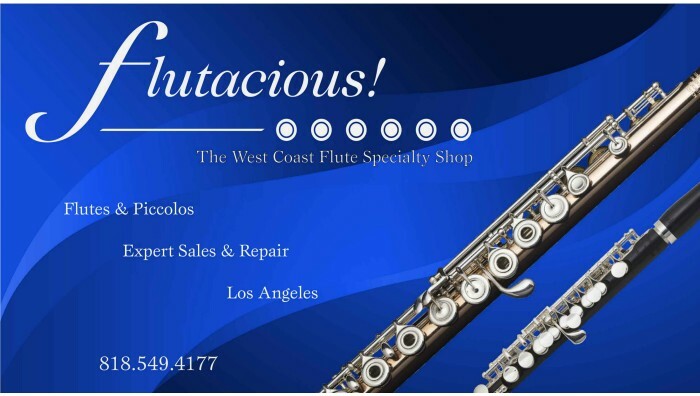 is a Los Angeles based Flute dealer. We sell Altus, Azumi, Brannen, Burkart, Di Zhao, Powell, Miyazawa, Muramatsu, Resona, Hammig, Jupiter, Jupiter Di Medici, Pearl, La Fin headjoints, Mancke headjoints, Verne Q. Powell, Trevor James, Amadeus, Powell, Sonare, Eastman, Yamaha, Gemeinhardt, Armstrong. We sell Piccolos, Flutes, Alto Flutes and Bass Flutes. We repair New Flutes and Used Flutes. We consign New Flutes and Used Flutes. We sell New Flutes and Used Flutes. The Flute brands that we repair are Altus, Azumi, Brannen, Burkart, Di Zhao, Powell, Miyazawa, Muramatsu, Resona, Hammig, Jupiter, Jupiter Di Medici, Pearl, Verne Q. Powell, Trevor James, Amadeus, Powell Sonare, Eastman, Yamaha, Gemeinhardt, Armstrong. The Flute brands that we consign are Altus, Azumi, Brannen, Burkart, Di Zhao, Powell, Miyazawa, Muramatsu, Resona, Hammig, Jupiter, Jupiter Di Medici, Pearl, La Fin headjoints, Mancke headjoints, Verne Q. Powell, Trevor James, Amadeus, Powell, Sonare, Eastman, Yamaha, Gemeinhardt, Armstrong. We overhaul and clean, oil and adjust Flutes with a COA. We replace pads and fix Flutes and piccolos. We sell Flute headjoints, Flute bodies, Piccolo headjoints and once again, the following brands: Altus, Azumi, Brannen, Burkart, Di Zhao, Powell, Miyazawa, Muramatsu, Resona, Hammig, Jupiter, Jupiter Di Medici, Pearl, La Fin, Mancke, Verne Q. Powell, Trevor James, Amadeus, Powell, Sonare, Eastman, Yamaha, Gemeinhardt, and Armstrong Flutes.